Photo by Sam Thiel Marshall's Logan Sherman (1) and Jordyn Hilgemann (14) go up for a block during their Class AA Tournament match against Park Rapids Area Thursday. Marshall won 3-1. ST. PAUL – For the Marshall volleyball team, close matches has seemed to be a contributing factor to their season. With one match separating the Tigers from a state championship appearance, Marshall knew it was going to have to put together a special performance. Standing in their path was an evenly-matched opponent in Concordia Academy-Roseville, who entered the match with a record of 28-3. The Tigers and Beacons instantly put together a classic battle, with ties and lead changes being exchanged at a high pace and chess-like strategic moves being made in pivotal moments. 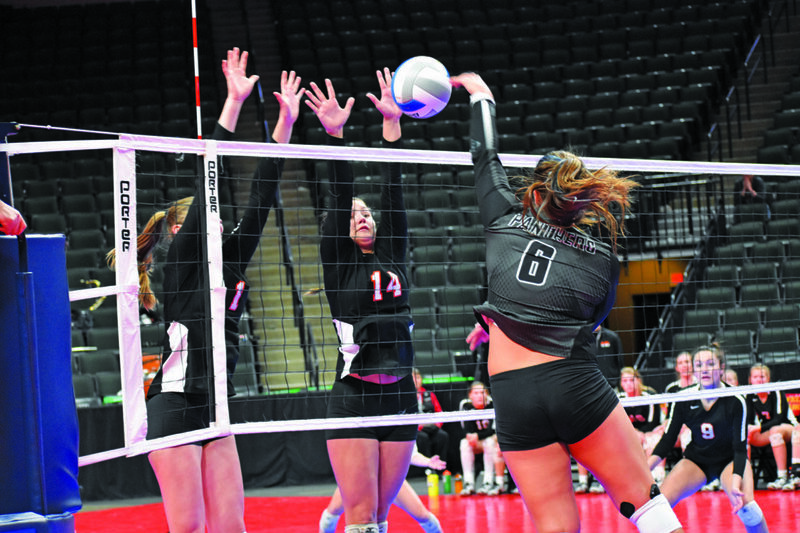 For the second day in a row, Marshall made enough of those moves and as a result, will be making yet another state title appearance with a 3-1 (24-26, 25-23, 25-20, 25-19) victory over Concordia Academy-Roseville Friday. The back-and-forth affair was evident right from the opening serve. Marshall took an early 3-2 lead before both teams traded points, with the Tigers still maintaining at least a two-point advantage. Concordia Academy-Roseville battled back and tied things up at 13, but a block by Jordyn Hilgemann and a kill from Bria Morris gave Marshall a 16-14 lead midway through the set. The Beacons wouldn’t go away, however, tying it at 18 before Marshall went on a 4-0 run only to be matched by a 5-0 counter by Concordia Academy-Roseville. Both teams would trade points to close the set, with the Beacons ultimately prevailing 26-24 to take a 1-0 lead in the match. Set 2 was another tightrope battle to start, with the frame deadlocked at 5-5 before Concordia Academy-Roseville took a 10-7 lead. Both teams traded points over the next several rallies as Marshall continued to hang around. The Tigers were able to cut the deficit to just one at 17-16 before an Erica Jones kill tied things back up at 17-17 and a Beacon error gave the Tigers the lead. More points were then traded and the two teams found themselves tied at 21 all and later again at 23. But Marshall would get the final two points and take Set 2 with a 25-23 win to tie the match at one set apiece. The third set was a similar story, with the beginning stages showing no momentum whatsoever for either team. Marshall held an early 5-4 lead, a margin that seemed to never change. After the Beacons tied things up at 14-14, both teams were in need of a spark. That’s when the Tigers delivered with a 7-2 run to take a 21-16 lead. Concordia Academy-Roseville would cut the deficit to within two at 22-20, but a key block by Logan Sherman made it 23-20 and Marshall took Set 3, 25-20 and a 2-1 lead in the match. Set 4 saw the Tigers jump out to an early 4-2 lead before extending their advantage to 10-5. 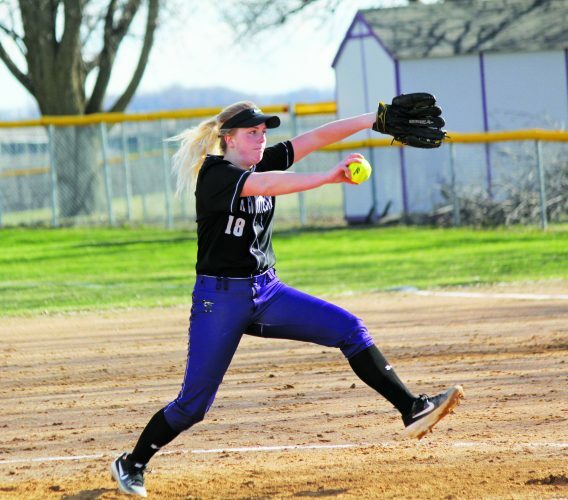 Concordia Academy-Roseville rallied, however, cutting the deficit to one at 12-11, but Marshall answered right back, going on a 5-1 run to take a 17-12 lead highlighted by a Sherman ace. Marshall continued to hang on to its lead late in the frame, and withstood one final push from the Beacons en route to a 25-19 fourth-set win and trip to the state final. Morris led the way for Marshall with six kills while Hilgemann added four and Sherman had three. Sherman and Rachel Schwarz each had seven set assists while Jones led in digs with six. 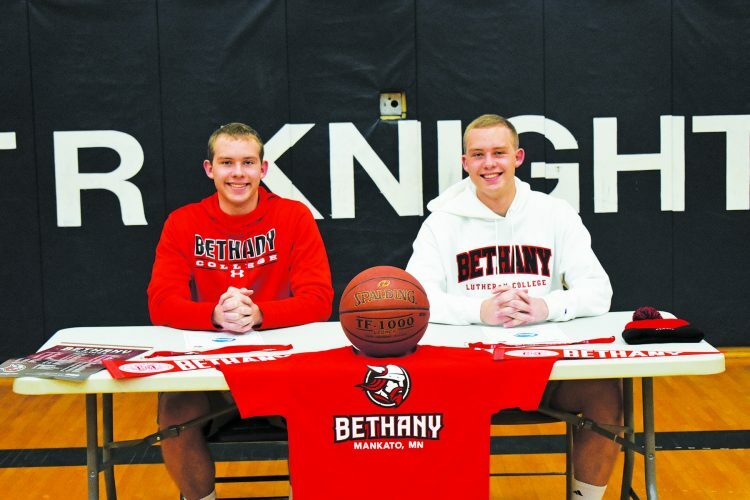 Morris said their key on offense was their ability to spread their attack to all aspects of the court and felt they did a great job of communicating with each other. Defensively, Sherman said their blocking up front was a big key in helping slowing down Concordia Academy-Roseville’s attack, especially when things were tight. Marshall (29-5) will face No. 4 seed North Branch in the title match, with first serve coming at 3 p.m. Westby said the Vikings are an extremely tough opponent and knows it’s going to be another challenging match. For his players, this is the first appearance in a title game. And they couldn’t be more excited. Sherman added this is something that they’ve dreamed about since they were little and they’re ready to accomplish their goal of bringing back a trophy.